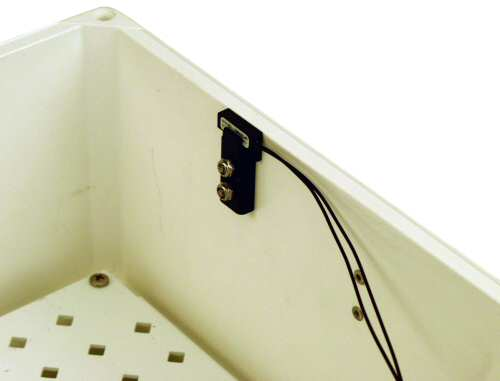 The 18165 Enclosure Door-Open Indicator Kit has a sensor that sends a signal when the door of the enclosure is open. It has two main pieces: one is located on the case side, the other on the lid side of the enclosure. The magnetic sensor inside the 18165 is monitored with a control port on the data logger. The 18165 Enclosure Door Switch monitors when the door of the enclosure is open. It consists of an actuator and a magnetic switch—one is located on the case side, the other on the door side. The switch is monitored using a control port on the data logger. All of our data loggers are compatible.